Today was a Saturdate with my husband. We went out for shawarma, mall walking, and a movie. Good times were had by all! The movie theatre we went to was in Dallas, and is part of a large open-air shopping and residential complex. To get to the theatre from ground level, there are two options: the elevator, or 4 flights of concrete stairs. As we approached the theatre, I decided this time to give the stairs a try. This is something I wouldn’t have even considered 140 pounds ago. Not for a second. So we started up the stairs, made it without any problems, and at the top of the stairs, I noticed I wasn’t even breathing hard. This is a totally new thing for me. You see, before surgery, every flight of stairs was a struggle. Not only was it excruciatingly painful for my knees and back, I always got winded about 5-6 stairs up. And of course by the time I finally made it to the top, I was out of breath, unable to speak at all. Today, that was not the case. In fact, I could actually carry on a conversation with my husband as we climbed the stairs. Once we got inside the theatre, there was a sign stating the escalator that normally carries patrons to the second floor where the auditoriums are was out of order, and that the elevator was available if needed. We skipped it and took the stairs up instead. Then once we were in the auditorium and were deciding where to sit, I said, “Let’s sit up at the top.” So we climbed the steps all the way to the top and sat in our seats, next to each other. We could put the armrests down without them pinching us. We could sit next to each other without being in each other’s space, and more importantly, could sit next to others without being in their space. I knew exactly how that felt. For so long, that was me. At that moment, I was so glad that wasn’t me anymore. And I am going to fight like hell to make sure I am never that woman again. Today’s eating was done all away from home, and resulted in lots of leftovers. I got in 94 grams of protein, 57 grams of carbs and 33 grams of fat. Total calories: 937. I also got in a quick 25-minute power walk at the mall tonight before we had dinner, and drank 120 ounces of water. I snuck a baggie of jerky into the movies (shh, don’t tell!) so I wouldn’t be tempted by the popcorn (my nemesis) and got a giant bottle of water from the concession stand to make up for the fact I snuck the jerky in, haha! 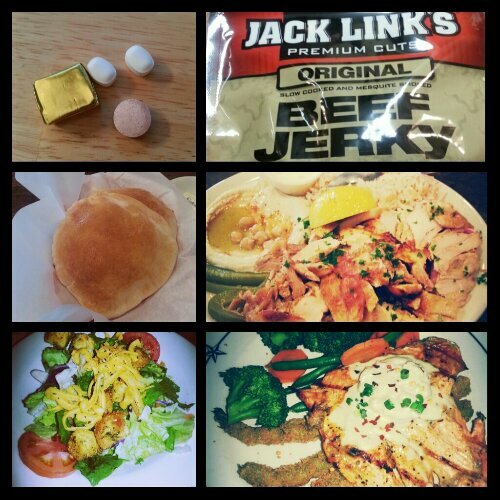 Today’s food choices, from upper right: Jack Link’s beef jerky; chicken shawarma, hummus, and rice (split the plate with hubby); salmon Oscar, steamed veggies and fried asparagus; mixed green salad with cheese and croutons; pita; multivitamin and calcium supplements x2, iron supplement. Not shown: shortbread cookie. This entry was posted in being thankful, celebrations, daily bites, eating, la guerra, little things, NSV's, post-op, success, the sleeve, vsg, weight loss surgery and tagged being thankful, benefits of wls, celebrations, daily bites, eating, la guerra, little celebrations, NSVs, post-op eating, post-op life, sorry for sleeve rocking, the little things, things of win and awesome, VSG, vsg realness, WLS. Bookmark the permalink.